In line with its Economic Recovery and Growth Plan to boost job creation and the economy, the Buhari administration will continue to create the right environment for the growth of technology companies, startups, and for innovation to thrive, according to Vice President Yemi Osinbajo, SAN. Prof. Osinbajo said this on Wednesday during his visit to Ventures Platform Hub, Abuja, alongside the British Secretary for Africa & International Development, Rt. Hon. Harriett Baldwin. The Vice President further commended the entrepreneurial drive of young Nigerians to create value in the technology sector, noting that the Federal Government is supporting technology and innovation because it is the “future starting today’. 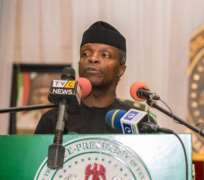 Prof. Osinbajo added, “I think just looking at what has happened with some of the startups that we’ve seen today, many of them actually started in the recession, while the recession was on, and they proved, by just the number of jobs they have created, the value and wealth they’ve created, that this is really the future starting today. “They’ve done so much work and innovation, so for us it is a no-brainer (why the Federal Government is supporting technology hubs); because obviously what we need to do is to create the right environment for these technology companies and for innovation to thrive, which is why we have started up first with the creativity and technology advisory group. Many of these young startups are members of these creativity and technology advisory group where they help to formulate policy with federal government policy makers. So, they help also to formulate policy in many of these new areas, especially in Fintech, which are some of the new areas where we need to formulate new policies. The Vice President then thanked the UK government for its cooperation in boosting technology and innovation in the country through its partnership. “I just want to say a very big “thank you” to the UK DFID for all the great support that we are getting and to say that, as they say, ‘the sky is no longer the limit,’ because technology seems to have gone way beyond the skies and we are very prepared as a government to support innovation in every way,” he said. At the event, VP Osinbajo interacted with technology start-ups and entrepreneurs. Accompanying the Vice President to Ventures Park were the Minister of Finance, Kemi Adeosun; and the Minister of Power, Works and Housing, Babatunde Raji Fashola. The Lord Mayor of London, Mr. Charles Bowman, was also at the event. Meanwhile, the Vice President also attended the National Last Days Gathering – LDG of the Calvary Ministries (CAPRO), on Wednesday. The event, with the theme: Confronting this Darkness, held at NOWA Education Centre, Karshi, Abuja.